The term diaspora usually refers to different cultures in the world becoming acquainted with each other and developing an awareness of each others’ lived experiences, which then transitions the focus from a “self” to a collective and conscious experience. 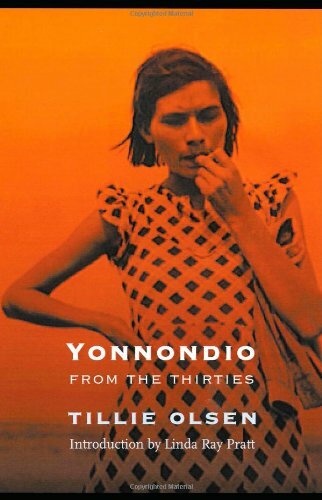 Tillie Olsen’s Yonnondio: From the Thirties manipulates the term diaspora in a literary sense by shifting points of views within the novel. Mazie and Andy’s points of view would remain separate in a traditional novel, however, Olsen intertwines them to signify a collective understanding of the suffering that occurs in their town. At times the narration of the novel seems to be dominated by Mazie, though in her dream about Andy there is a convergence of both narrators. In passages such as this, the rhetoric used attempts to accomplish a couple of things: firstly, the language of the passages captures the emotional turmoil of the mining town; secondly, it attempts to create a social awareness of the conditions of the town. Both lenses are juxtaposed using vivid imagery to demonstrate the nature of two minds combined to create a singular experience. While Mazie is the primary narrator, she personifies Andy in her imagination which allows Mazie to step outside of her own consciousness and experiences to gain another perspective. She sympathizes with others because she does not have a guide to explain the world to her. Ultimately, the shifts in points of view and imagery are necessary to encapsulate the inner and physical turmoil of the town. During that particular passage, Mazie steps out of her own consciousness by constructing a third person narrator within her dream. This third person narrator, while being a fragment of Mazie’s mind, helps guide the imagery of her mind in a more eloquent manner. Before Mazie’s dream of Andy even begins, her thoughts become staccato and incomplete as she asks herself, “Mebbe I am black inside too… the bowels of earth… The things I know but am not known… sun on me and bowels of earth under…” In this passage, incoherence is seen by the multiple ellipsis, signifying the thoughts that Mazie cannot place together in her mind. The first line being an unanswered question—and lacking a question mark—suggest that Mazie is somehow drifting to this other consciousness or version of her self that is more coherent because the phrases and questions she poses are actually quite sophisticated, despite the misspelled words that would suggest the opposite. Oddly enough, the questions she poses are all found again within her dream about Andy. Furthermore, in her dream, not only does Mazie make up a third narrator, but takes it upon herself to imagine Andy’s anguish. In a sense, Mazie has to imagine Andy to understand her own questions because she does not have a guide to make sense of her own world. By the end of her dream, Mazie ends with a collective understanding of the society she lives in. The diaspora—or the collective understanding of the suffering of her town—commences with her personal anecdotes, transitioning to an eventual understanding of Andy (an individual apart from herself), and later on the miners of the town. Once the staccato phrases of Mazie’s mind stop in her own voice, there is an abrupt transition to her dream about Andy with a new third person narrator that personifies nature. The personification of nature by the third person narrator is important because it alludes back to Mazie’s staccato thoughts of the “bowels of the earth,” in a more eloquent manner. The personification of nature is evident when Mazie describes, “Andy Kvaternick stumbles through the night. The late September wind fills the night with lost and crying voices and drowns all but the largest stars.” In this passage, Olsen takes advantage of the imagery of Andy stumbling through the night in order to set up the voices of the September winds. In a way, the voices of the wind serve as an extension to not only the thoughts of Andy, but Mazie and the people of the mining town. Mazie acknowledges in her dream that there are people suffering in her town and not only does she notice it, but so does Andy. In the first two sentences, the social diaspora becomes apparent because the voices of the night unite the suffering of the town, bringing a singular experience to a collective one. Furthermore, when the voices are drowned by the “largest stars,” the collective suffering of the town is characterized as a miniscule moment in time. The imagery of the temporal suffering of the town does not negate their suffering in any way, but rather it enhances the feeling of suffocation and being outside of society. Though, oddly enough, it is through the isolating imagery that a unified sense of society is illuminated. The third person narrator in the dream about Andy is important because it engages Mazie into a dialogue with herself, illuminating two of the many voices within the passage. In the same paragraph, there is another interesting shift in which the third person narrator momentarily becomes absent and Andy’s internal thoughts dominate the narration. The passage reads: “Chop, chop, goes the black sea of his mind. How wild and stormy inside, how the shipwrecked thoughts plunge and whirl. Andy lifts his face to the stars and breathes frantic, like an almost drowned man.” The onomatopoeia of the chopping sound briefly gives insight to the raw emotions and thoughts of Andy’s mind. This brief insertion illuminates a diaspora—or rather a convergence—of voices and points of views of narrators, working together to understand a singular feeling (sorrow) in an abstract manner. In other words, though Andy and others may hear the chopping noises in their heads, the context in which they hear them differs, yet there is still a mutual understanding that the chopping noises are unpleasant. The onomatopoeia possibly alludes to the chopping sounds within the mine; sounds he is unable to escape. Combining the chopping sounds with the black sea also suggest how Andy’s creativity is suppressed by the worrisome nature of the mines. In other words, the “creative juices” that Andy may posses are tainted black in a symbolic, yet literal, manner because of the black dust of the mind, while the danger of the mines creates a consistent fear within Andy’s mind as portrayed by his “shipwrecked” thoughts. The description of the plunging and whirling thoughts further illuminate the idea of the mines eradicating the creativity and mental stability of his mind. As this small passage continues, the narrative diaspora begins to evolve when the narrator shifts from Andy’s inner thoughts to his physical state. Even though the imagery of the wild ocean is thoroughly described within his mind, the imagery overwhelms his physical senses. The wild ocean becomes a metaphor for the enclosed nature of working in the mine. In a sense, Andy is being “drowned” by the mines in every way possible. By uniting the different elements, an artistic diaspora is set for the sole purpose of demonstrating the slow destruction of the sophistication of Andy’s mind. In the second paragraph of the daydream, the diaspora continues when the narration subtly shifts from the narrator to Mazie. The diaspora in this paragraph pertains mostly to a shifting point of view, to which the reader is exposed to a more haunting narration. Mazie begins by saying, “But it is useless, Andy. The coal dust lies too far inside; it will lie there forever, like a hand squeezing at your throat. The bowels of the earth have claimed you.” Mazie’s narration is different from the previous narrator, as she directly addresses Andy, condemning him to a horrible fate. By doing this, Mazie projects an idea of her own fate and unifies it with Andy’s fate, illustrating a constant feeling of doom in the town. There is also a transition between the violent nature of Andy’s mind (as seen in the first paragraph), to a personified and cruel version of nature. In this way, there is a new awareness of the symbolic within the mind and the symbolic of the physical world. By uniting these two aspects within the rhetoric of the daydream, Olsen works to create a social awareness that is not only meant for her audience but her characters as well; even the imagery works in such a way that unites and creates an awareness. With this shift, Mazie alludes back to the staccato thoughts she had before her dream of the “bowels of earth,” re-imagining the cruel imagery she could not previously put into words. The final paragraph of the dream not only encompasses the voices of the miners, but thrives on the imagery of Andy walking into the darkness of his own death. In the passage, Mazie’s narration demonstrates a strong demand of thought and power, so much that she no longer uses the third person narrator to help express herself. Instead, she draws upon the voices and phrases she associates with miners. For example, Mazie narrates, “But walk in the night now, Andy Kvaternick, lift your face to the night… ‘Andy’, they are calling to you in their lusty voices, your fellow workers- it is an old tory to them now. ‘Have one on us’…You have taken your man’s burden, and you have the miner’s only friend the earth gives, strong drink, Andy Kvaternick.” In this passage, Mazie adds the voices of the miners by the end of her dream in a culmination of death. In other words, Andy is doomed to death in her dream because she associates mining with danger and death. The fact that the voices of the miners are prevalent, even in their death, demonstrates an overlap of voices, which Mazie understands to be important. She understands there is a collective suffering among the miners and that eventually Andy, or any other person like him, will suffer the same fate. This convergence of consciousness helps Mazie develop a perspective of not only her own fears, but the same fears the whole mining town faces. All in all, Olsen’s creation of Mazie’s dream of Andy Kvaternick is a sophisticated and intellectual documentation of the suffering in the town. Olsen manages to create an affective manuscript that encompasses the suffering of not one, but several families in passages like this. In this one passage alone, there are several voices that work to create a consciousness that encompasses the “self,” but also incorporates the experience of the “collective.” The narrative becomes three dimensional and provides an emotional thermometer of one town. 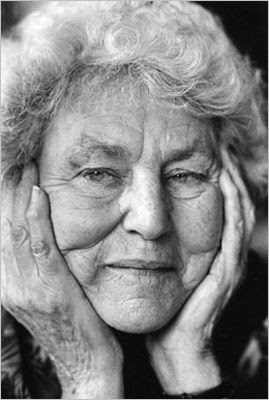 Tillie Olsen, 1912-2007, is internationally known and honored for her powerful, poetic writing depicting the lives of working-class people, women, and people of color, with respect, profound understanding, and deep love. Her books, Tell Me a Riddle, Yonnondio from the Thirties, Silences, and her essays and lectures, have been translated into twelve languages. Her works are considered by many to be central to working class literature, women’s studies, and the understanding of creative processes and the conditions, which permit imagination to flourish. (Bio from the Tillie Olson website).